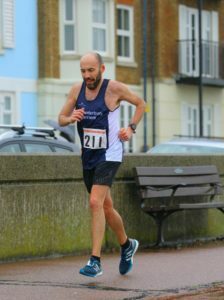 Friday 30th March saw 14 Harriers turn out for the 35th Folkestone 10 mile.There were 673 runners in total on the day and all Harriers came back in the top half of the finishers. Extremely wet and windy conditions made the race tough going on the way out, into the wind, but the rain came down hard in the second half. Despite the weather there were 5 PB’s, including Yiannis, 1.00.13, Mark Baker, 1.08.12, Mark Duffy, 1.10.16, Daren Parris, 1.17.31 and Stephanie Bancroft, 1.21.18. We had one debut from Lidia Hill at 1.27.01. Well done to all those who PB’s as these challenging conditions.